A 32-year-old woman received two suspended sentences last Friday at Craigavon courthouse – in two different courts. 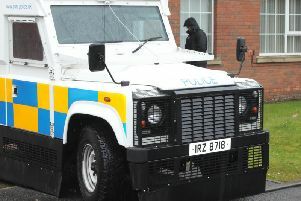 Sarah Ann Connors, Albert Street, Lurgan, was sentenced to five months in prison, suspended for two years, in the magistrates’ court. This was for the theft of clothing valued at £118.95 from JJB Sports on July 22, 2011. The court heard that police had gone to Rushmere and saw the defendant walking in the car park with a number of items hanging out of her handbag. They noticed that the identity tags had been damaged. Her solicitor said she had appeared upstairs in the Crown Court where she had been given a five month suspended sentence for the theft of items worth £899 from B and Q. He explained that Connors had been addicted to heroin but in the last two and a half years she had been clear. District Judge, Mr Mervyn Bates, said it was very difficult to go against a decision of a higher court and imposed a concurrent suspended sentence.